Getting older isn't without its aches and pains. There are the rare few that really do grow old gracefully (and painlessly). However, the rest of us will experience any number of aches and pains, injuries, bouts with illness, and trips to the doctor. A small price to pay for the glory of growing old! Yet these ailments of aging are undoubtedly a hindrance. Frequently they can be alleviated, sometimes they can be mitigated, and every once in a while they can be annihilated. Often a combination of lifestyle changes and drug therapy are the key to success. Sometimes genetics are just too powerful, and a person's life does unfortunately become a routine of prescriptions in ever increasing quantity. The debate is constant about the role of pharmaceuticals versus a more holistic approach. There are strong arguments on both sides; this is a different story for a different day. What is a growing concern for all parties is polypharmacy and how it affects the elderly. Polypharmacy is excessive use of prescription medication to treat a patient. Specifically, it is an increase in the number of medications and/or the use of medications that are more than medically necessary. Polypharmacy is increasingly common and is especially prevalent in the elderly. Specifically, at risk of polypharmacy are elderly patients in nursing homes, ambulatory care, and hospitals. 1 Polypharmacy increases the risk of negative health consequences in the elderly. The negative health consequences are numerous and vast. Among a very lengthy list of concerns are dangerous drug interactions, impact on organs, physical impairment, cognitive decline and the onset or exacerbation of geriatric syndromes. The main argument against polypharmacy is that it is a band-aid of prescriptions that ease the ailments but do not help the patient heal the underlying cause, and in fact leads to more health problems. One of the main arguments for polypharmacy is that quite often, at this stage in the game there is no cure for many of the ailments that plague the aging so the best that can be done for quality of life is to alleviate the symptoms. Regardless of the current prevailing thought of both the patient and their doctor(s), all parties concerned should be aware if polypharmacy is adversely affecting their loved one. 1. Be consistent in where prescriptions are filled. Before a prescription is filled or refilled a pharmacist should be consulted. A good pharmacist stays current with their field and can be an invaluable resource. It is helpful to use the same pharmacy to fill prescriptions as they have a current record for all prescribed medications. If certain items are mail ordered and/or paid for out of pocket elsewhere the main pharmacy that is used should be informed so they can have an up to date record to avoid any potential negative drug interactions. 2. Keep track of over-the-counter medications. Be aware if your aging loved one is taking any nutraceuticals, supplements, vitamins, etc. Everything that is taken (especially in a concentrated form such as those previously mentioned) should be documented. Negative drug interactions can vary from drug-drug interactions to drug-disease interactions. Also, some medications should just not be used by the elderly without caveats. In working closely with both the prescribing doctor and the pharmacist, the more negative aspects of polypharmacy can be avoided. Drug recalls are rare and well managed by pharmacies and insurance provider notifications (another important reason to have consistency in where prescriptions are filled). However, over the counter medications, nutraceuticals, etc., do not have the same kind of oversight. The family must be proactive in keeping an eye on these items' safety and efficacy, as well as monitoring expiration dates. 3. Follow a precise plan for organizing and taking medication. If a medication is going to be utilized, compliance is important. When to take it, how many, what times, for what period of time, with or without food, side effects, etc. It can be overwhelming! Having a specific person in charge of medication management is ideal. 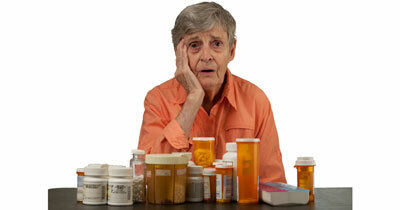 Many home health agencies offer this invaluable service in the form of medication management and safety supervision. In more complicated and complex medication situations a skilled nurse should be hired. Doctors should be communicated with on a regular basis regarding current medication, its efficacy, and overall medication management. 4. Voice any concerns and seek a second opinion. If you, your family members, and/or any other advocate for your senior feel that polypharmacy is an issue there are a variety of avenues to seek assistance. The primary care doctor should always be the first stop. Voice your concerns about the multitude of medications and see if there is any recourse. Seek a second opinion from a qualified medical health professional. There are many different doctors, many different approaches to healthcare. It is best to decide which practice your primary health professionals will belong to as well as choosing a reputable heath care provider as a backup/second opinion. This circumvents the innate desire to "shop around" for a doctor who shares the same opinions as you, but may not necessarily be the most qualified. A geriatric specialist is a fantastic option, especially for those aged 75 and older. Insurance undoubtedly plays a large role in healthcare access. If you feel that polypharmacy is an issue for your elderly loved one, and your options are limited due to insurance constraints, you are always free to seek assistance privately. Private pay visits to a qualified health care professional for a second opinion are common. A non-insurance billable office consult is less expensive than you may expect. Private pay visits are usually billed at a lower rate and many offices can offer a discount upon request. Many local governments, community support groups, and charitable entities even have subsidized programs and financial support to assist those in need. Polypharmacy can affect your aging loved one in many ways. It is important to keep track of medications, their efficacy, and any side effects. Medication management by a family member or outside hire is very helpful and sometimes a necessity to ensure the above details along with medication compliance. Some medications are vital, others may be able to be mitigated over a period of time, but nothing should be amended without a doctor's consult! Utilize the knowledge of your local qualified pharmacist. A knowledgeable pharmacist along with a trusted health care specialist and likeminded advocates can help your elderly loved one live their best life, untethered from the prescription bottle.